We're not quite sure how King Midas was bestowed with the power to touch an object and turn it into pure gold but we do know one thing; we're seriously jealous. If we were gifted with the Midas touch, we know exactly how we would use it. First, we'd touch every piece of jewelry in our jewelry box to transform it into 24 karat gold so the days of wearing rhinestone studs in our ears and Sterling silver chains around our necks would be no more. Next, we'd touch literally everything in our possession and sell it to pay off some pesky credit card debt. It's a foolproof plan except we still have one problem: who can supply us with the Midas touch? We haven't quite invented a product with the power to turn every object into pure gold (yet) but we do have a way to create the appearance like you're dripping in gold. 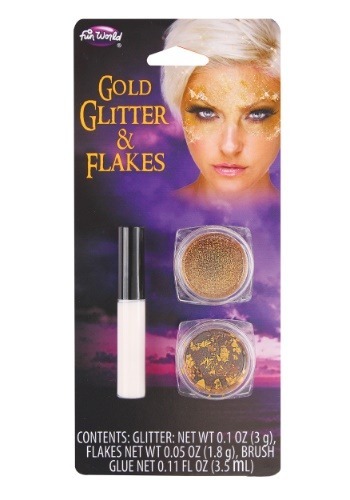 The package of gold glitter and flakes comes with a glue that is safe enough to apply to the skin. Simply speckle the gold glitter and gold flakes (both included) onto the applied glue and allow it to dry. It's easily removed with with soap and warm water. You can never wear too much gold right? Use this makeup kit to accompany any 70's or pop star themed costume!